All entrants receive special gameday promo. Top 8 receives additional prize including foil textless kalistra highborn promos. Decklists required. All 8 entrants of side drafts will receive promos in addition to normal prizes! $10 Library of Alexandria/Foil Polluted Delta Tournament at Die Hard Games! Format: Vintage /w 20 proxy. All proxies must have clear descriptions of the card being imitated and must be clearly labeled on your decklist. Asterisks * are fine. Top 2 prizes based on 20 people, top 4 prizes based on 25 people, top 8 prizes based on 30 people. I expect to give out all prizes listed since turnout for my first Vintage tourney was great. This event precedes my $10 Sapphire tournament, held the next Saturday on March 13th. Play in both $10 vintage tournaments and receive $1 store credit! Store credit can be used on anything except tournaments. This is a great lead-in tournament to my next eternal weekend, so I'm very excited for it. Since this is a part of gameday I should have extra goodies lying around that will be included as bonuses for the vintage portion. I'm excited this event is now a part of gameday. Should be a very big day with lots of different players. I will most likely be attending, and most likely with a couple people in tow. Big update- This event is now a part of Worldwake Game Day since they were able to get me supplies after all. I now have 2 main events as part of game day. 12pm $10 standard for a box of Worldwake and now this 1pm Vintage. Full details in main post. With additional events added I'm really looking forward to it. 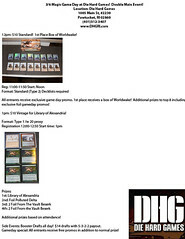 There really is something for everyone, so if you have a friend who tags along but doesn't play Vintage (there were a couple at my last event) there will actually be stuff for them to do this time around. Added flyer /w full info to the main post. Should be drafts a plenty and standard will be already running ahead of this event. First time I've run two main events at the same time, but both tournaments will run smoothly. That's it for now. Thanks as always for the support. You guys are why I do these. I don't see any reason why I wouldn't be at this whether i'm Type 1ing, Type 2ing, Drafting, or Modoing The possibilities are endless! I dunno I mean I suppose we could I'll text you or something later this week. I'm in. Sadly, I'll be getting there alone. Team chauffeur: party of one. Sca-rubbed out. Bad. Kudos to Bill Rosa for an excellent control mirror match in round 1 of the side event. Impeccable opponent. Thank you Dave, for hosting another great event! Hope you get a good turnout next weekend. Took this one down with Tez, splitting with Care Bear in the finals. I believe the Top 8 consisted of 4 Tez (myself, Taylor Nottage, Oliver Beaumont , and Josh Cutler, though all fairly significantly different builds), a 2 Card Monte (Brandon Jones), a monobrown Workshop Aggro (CareBear), an Ichorid (Micah Greenbaum) and a TPS (sorry didn't get your name). Great event Dave; see you next week! Took this one down with Tez. I believe the Top 8 consisted of 4 Tez (myself, Taylor Nottage, Oliver Beaumont , and Josh Cutler, though all fairly significantly different builds), a 2 Card Monte (Brandon Jones), a 5c Shops (CareBear), an Ichorid (Micah Greenbaum) and one deck I didn't see, which i'm pretty sure was another Tez. I was the TPS. It was a great tournament to get back into magic with after 5 years off. Thanks for a great event. I wish I could make next week as well but sadly I can't. Good luck to everyone who can. Thank you for the kind words. Was happy with turnout. 18 was good enough. Even though prizes were based on 20 + entrants, I still paid out to top 8 and gave out the main prizes. Congrats to Andy Farias/Carebear for splitting. There were a good 30-40 people in my store store between both events for Game Day, but I was hoping for slightly higher vintage turnout. Next week's Eternal Weekend should be good. I thank those who showed up for Gameday. Saw lots of new faces. Dave are you putting up decklists, or just going to combine this one with next weeks? I'll be putting up top 4 decklists /w pics sometime this week in a separate thread. Thank you and hopefully see you again this weekend.